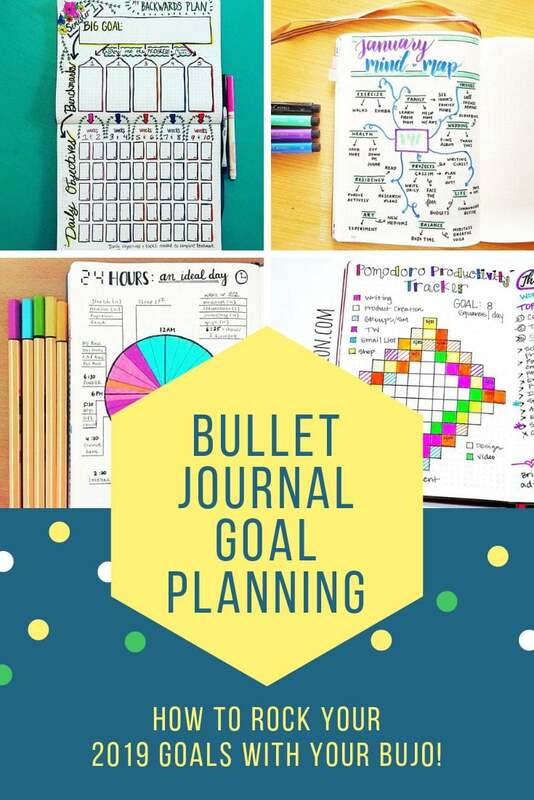 2019 is fast approaching which means it’s time for some Bullet Journal goal tracker hacks and ideas to help you rock your planning and achieve your goals! It’s almost time to bid 2018 a fond farewell and start thinking ahead to what we want to achieve in 2019. 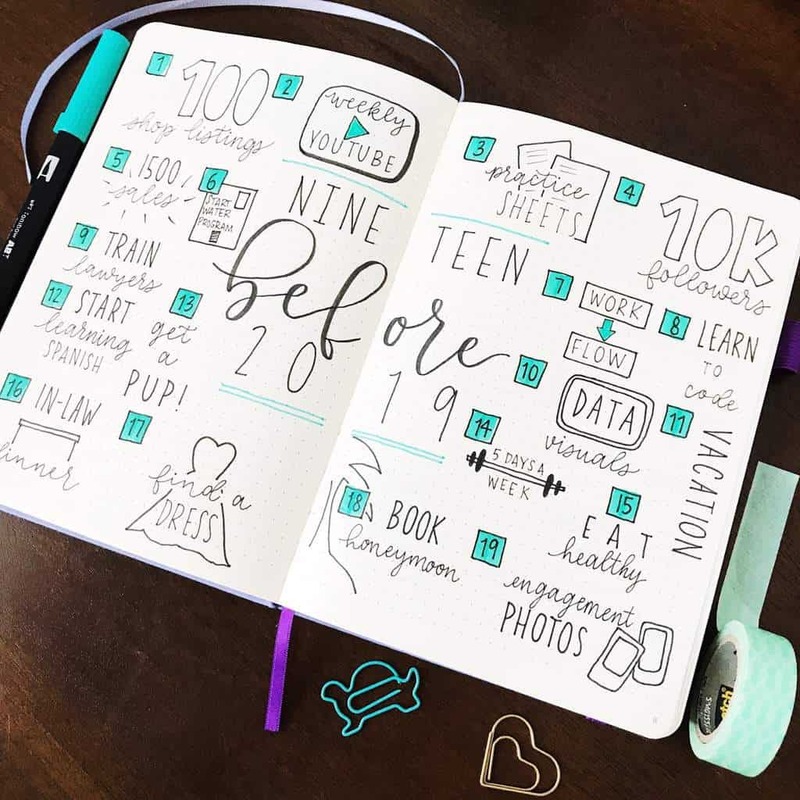 You know we’re a little bit crazy about Bullet Journal Tracker layouts so it’s the perfect time to dig into some Bullet Journal goal tracker hacks that’ll help us rock the new year! 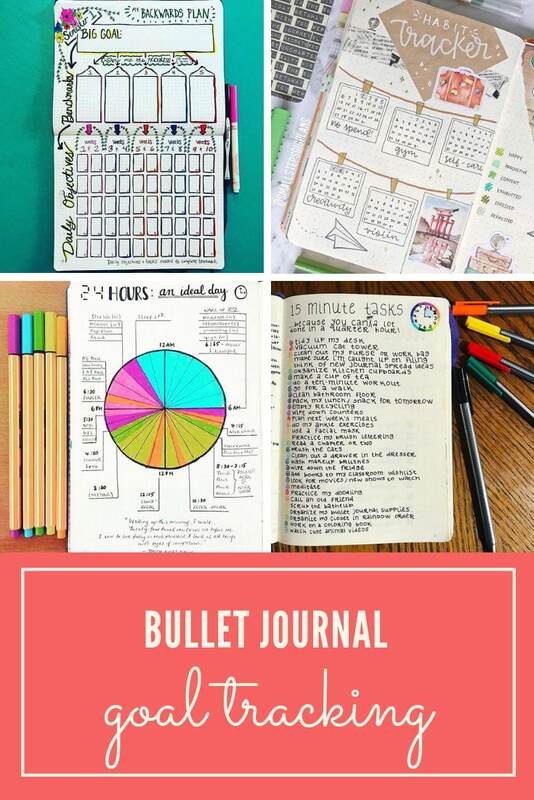 Whether your goals are business focused or you want to improve your fitness or just get a handle on your family’s meal plans these Bullet Journal ideas will help you get off to a great start! 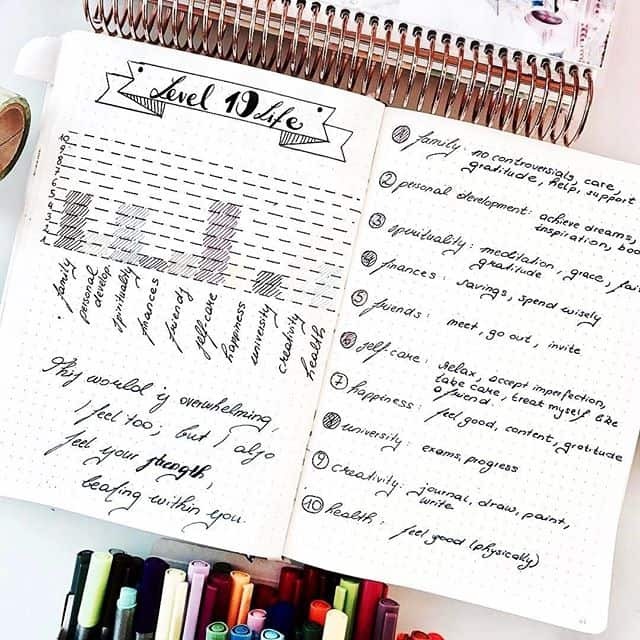 Adding goals to your bullet journal is more about just having a list of things you want to accomplish. You also want to have specific goals that are achievable and measurable (think about the SMART method), and also have a list of tasks to be completed in order to achieve those goals. 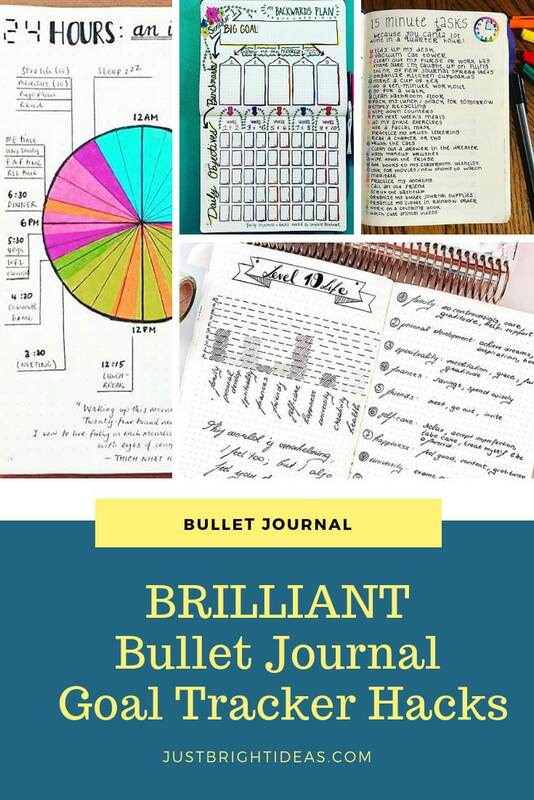 This is one of the many benefits of using a bullet journal, and you can include end-of-year goals when working on a bullet journal in the fall. Why should you set goals? If you have ever had dreams or aspirations, you might find that seem more like far-fetched dreams instead of realistic expectations. This is why setting goals is so important. When you set goals for yourself, you also have a list of tasks needed to reach those goals. This is where your bullet journal comes in, and will help you reach all those dreams you have wanted to achieve. Choose just 2-3 big or small goals, then make sure you have a detailed task list for each of those goals. For example, if you are finishing a home remodel, you might include a list of supplies, how much it will cost, a schedule for getting the repairs done, numbers of contractors, and other details. These goals can be for anything in your life, including home, personal, and professional goals. It is also a good idea to use the SMART method, which means your goals are specific, measurable, achievable, realistic, and time-bounded. Review the year that’s past – how was 2018 for you? It’s up to you whether you make close out your 2018 Bullet Journal with a year in review spread, or whether you kick off your 2019 journal with it, but whichever you choose I personally feel this is a must do activity. Taking time to sit down and take stock of the highs and lows of 2018 will help you decide what you really want to achieve in 2019. I love this two page year in review spread that visually records each month’s highlights and then has room in the right hand sidebar to add more notes. Once you’ve reviewed the year that’s past it’s time to start looking ahead to 2019. Spend some time thinking about what you want to achieve this coming year. What are your big goals? How will you break those down into actionable steps? Are their any good habits you want to make, or bad ones you want to break? 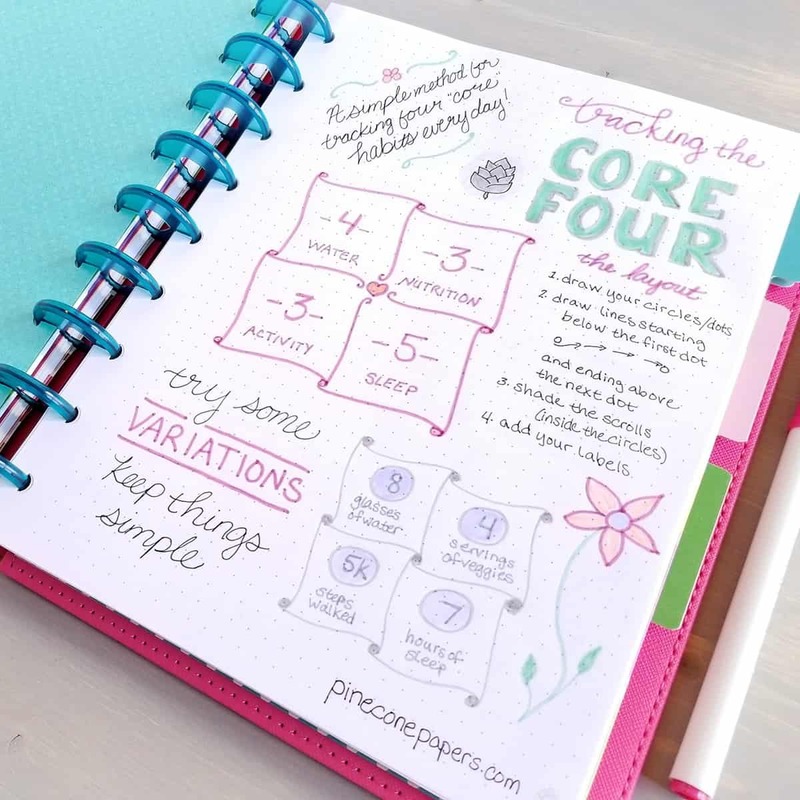 These spreads will help guide you through the planning process. I like this spread because it’s sort of like a typography mind map! Draw out some boxes and then fill each one with a goal. The other reason I’m sharing this spread is that it’s a good reminder that goals don’t have to be HUGE. Write a new book is a pretty big goal, but something simple like bake bread is also something wonderful to achieve. Okay this spread is actually nineteen before 2019 but you get the picture right! It’s just another (fun) way to come up with your goals. Hal Elrood is a bit of a productivity genius and in his book The Miracle Morning he talks about your Level 10 Life. The start of the year os a good time to give yours some thought because it will help you define your goals for 2019 and beyond, and then give you a way to track them. If you want to know more check out our Level 10 Life post. 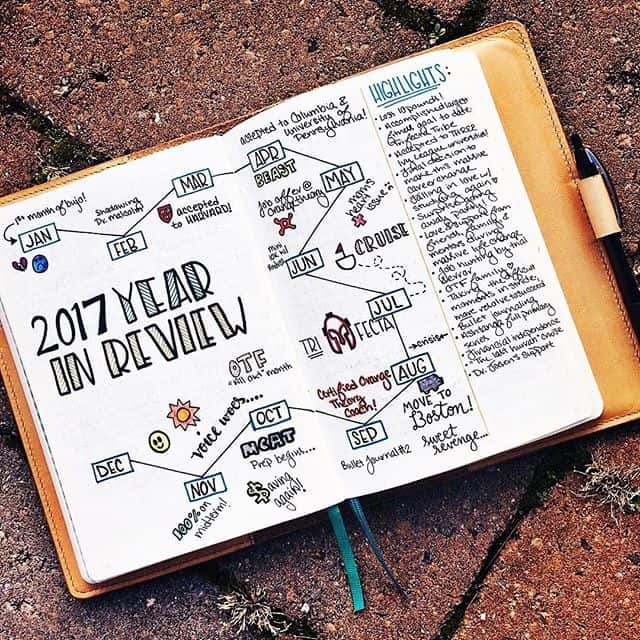 You need to add a little “planner essence” to your Bullet Journal so you can see your year at a glance. 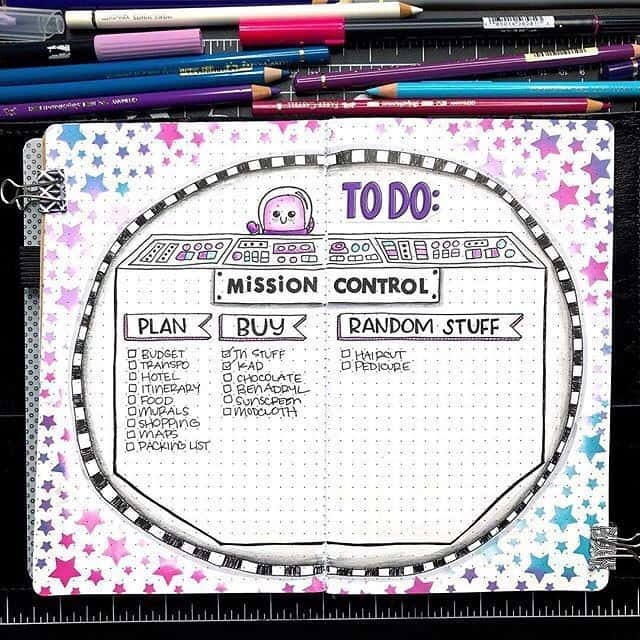 This calendex layout is a good way to do it, and I like the little Bullet Journal hack of shading in the weekends. You can now fill in the calendar with your goal deadlines as well as blocking out time that you might be on vacation so won’t be working. 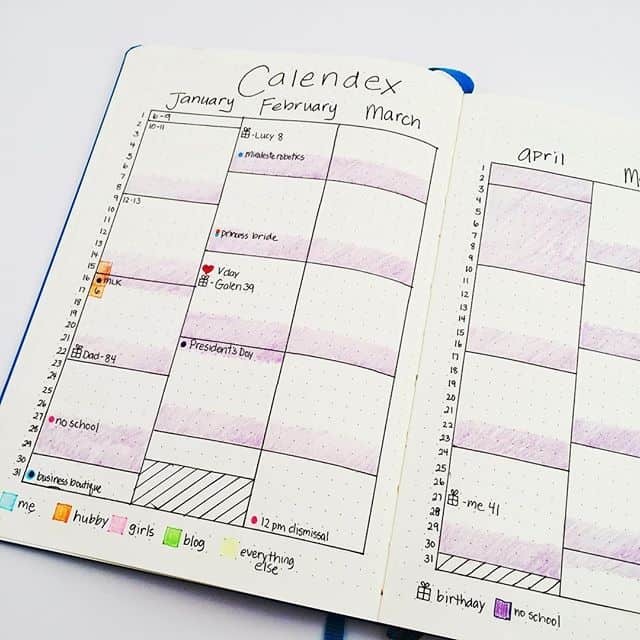 Note it can be compelling to go ahead and add all kinds of fun things like birthdays and anniversaries to this calendar but it can get a little cluttered so you might want to try a separate spread to keep track of those things. 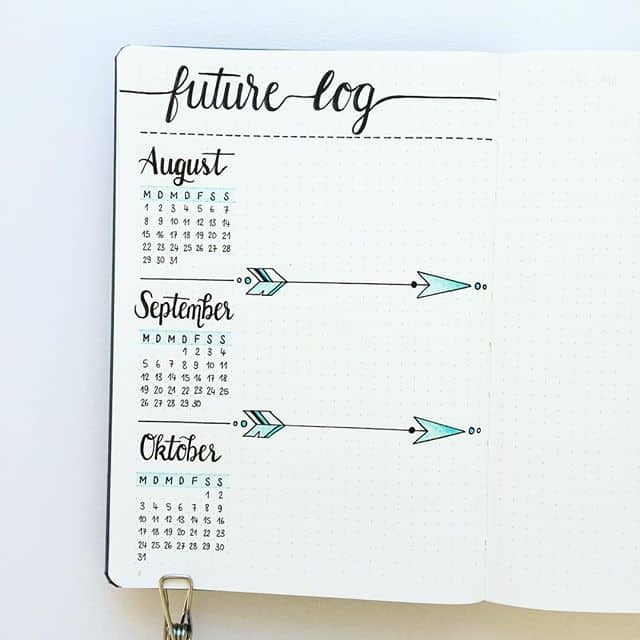 Another way to see the year ahead at a glance is to try a future log spread like this one. What do you want to learn this year? Whether you’re trying to achieve a personal goal or a business one you’re sure to need to learn a new skill or two. 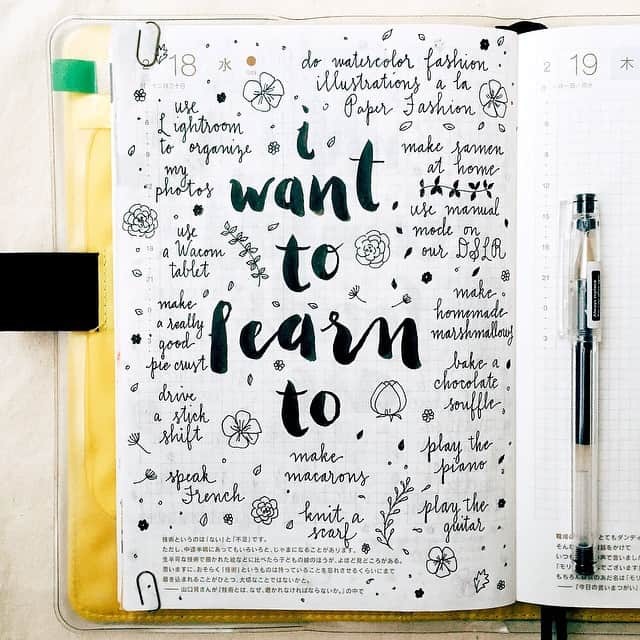 How about hand lettering for your BUJO? Now you have your annual goals all set out it’s time to start breaking them down. 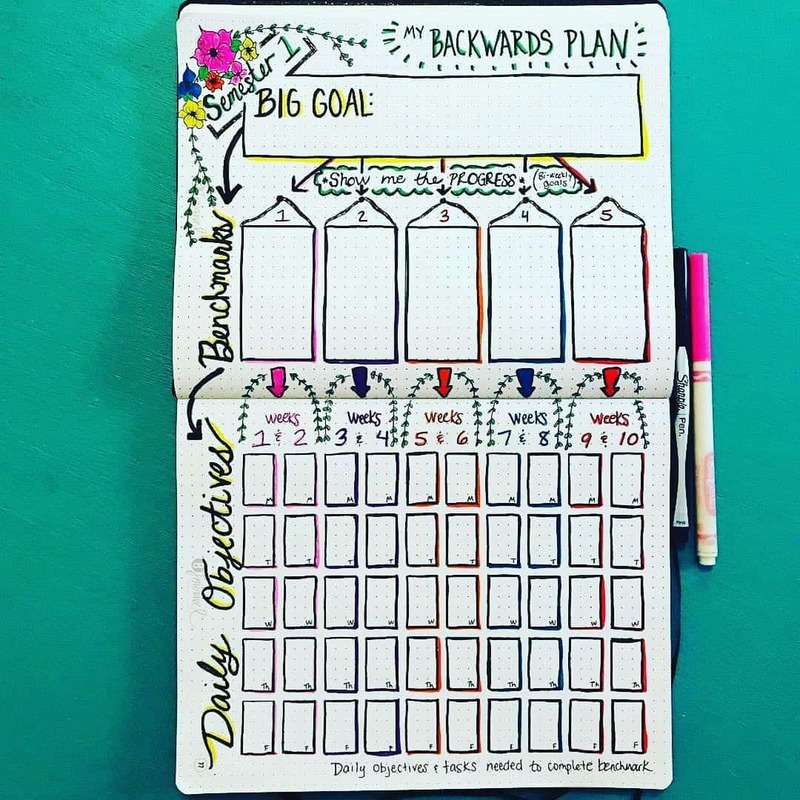 So think about what your monthly planning will look like. 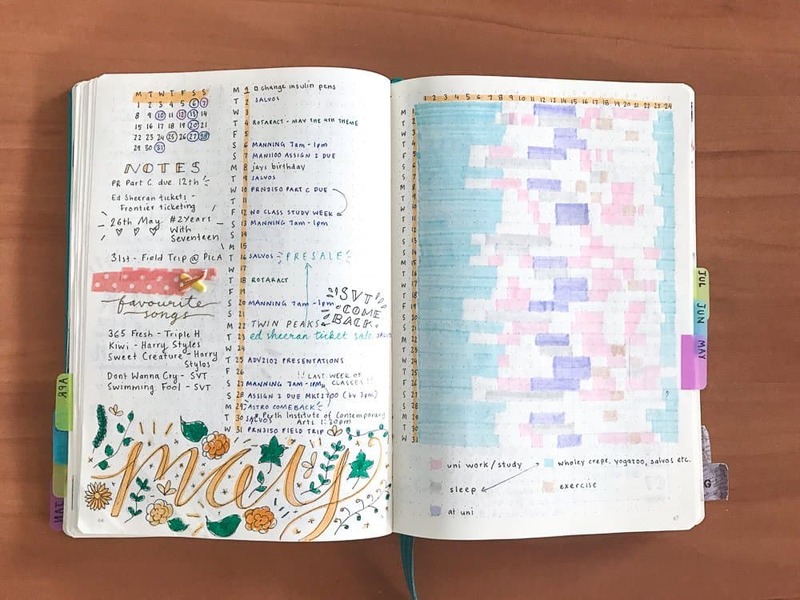 These spreads and hacks should help you plan what you want to include in your bujo, and don’t forget you can switch things up each month while you figure out what works for you! 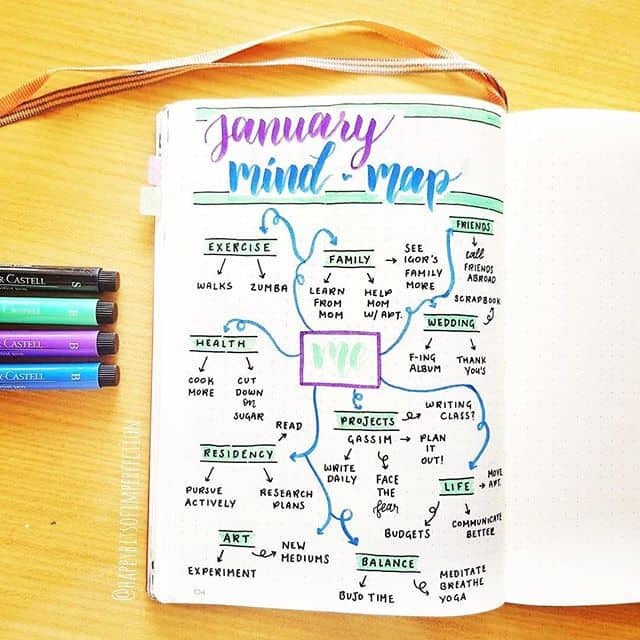 Mind maps are a great way to break down your goals. 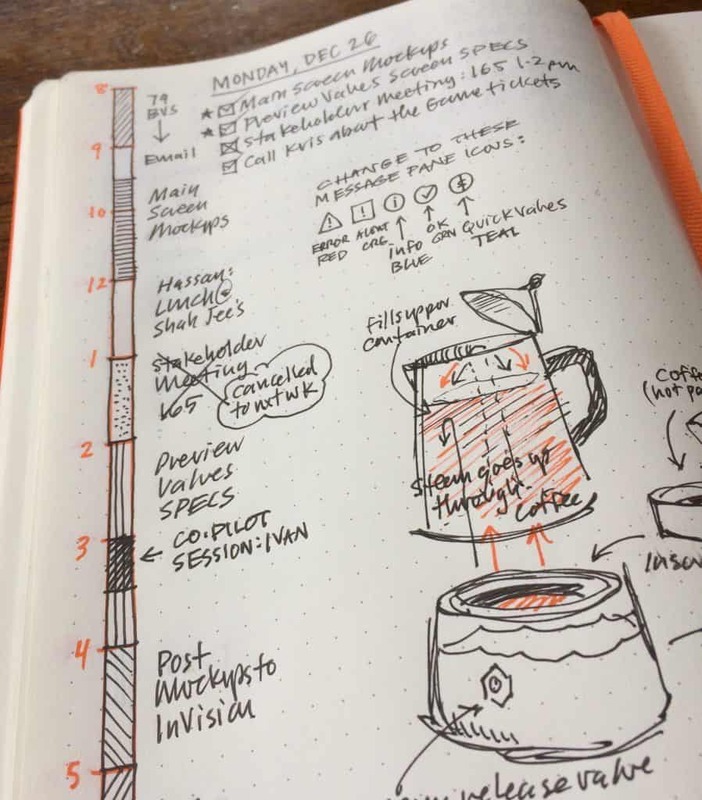 Start out your month with one so you can see what you want to work on in a really easy to follow visual. You could make one for your annual goals at the start of the year too. Have you ever noticed that your goals can be a little daunting and cause you to procrastinate but when you call it a bucket list you’re all eager to get started? It’s just the same thing by another name really right? 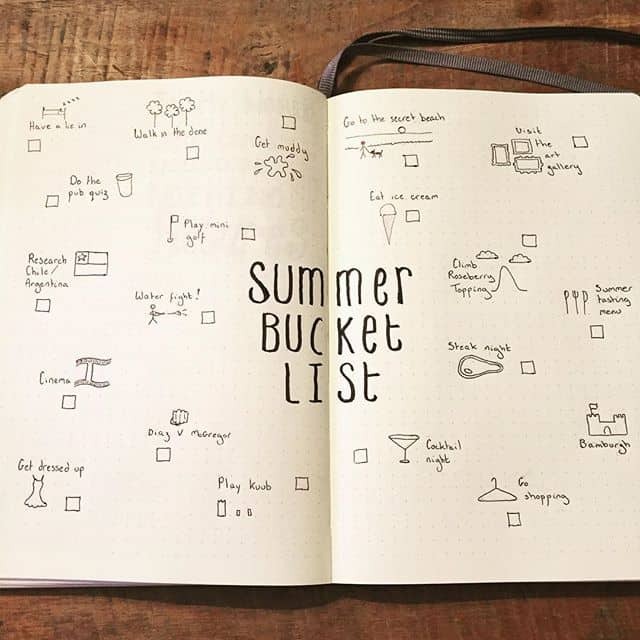 Although our bucket list goals tend to be smaller and seem a lot more fun! So embrace it, take your annual goals and try and add some bucket list fun to them. 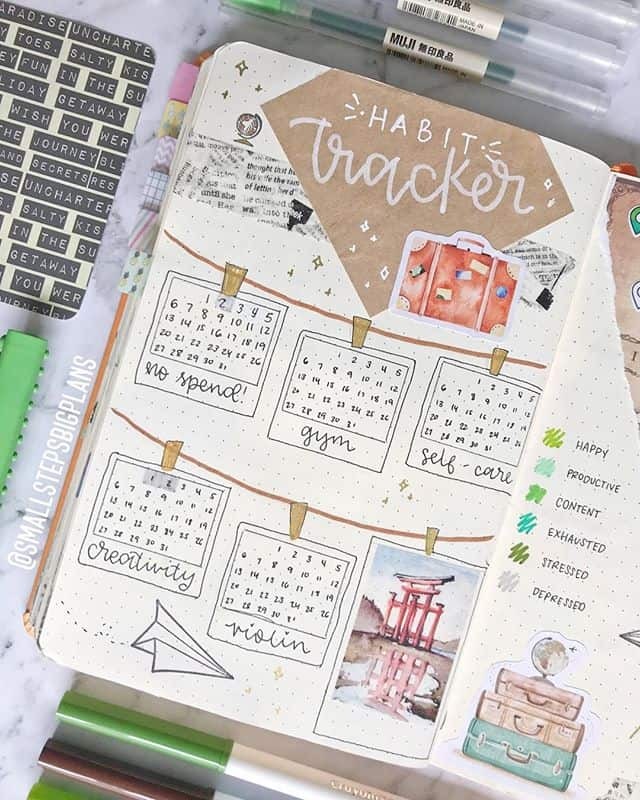 Cultivating good habits is an important part of meeting your goals so make sure you leave room for a habit tracker each month. I really like this layout with the little calendar squares pegged up on a line. How cute is this! 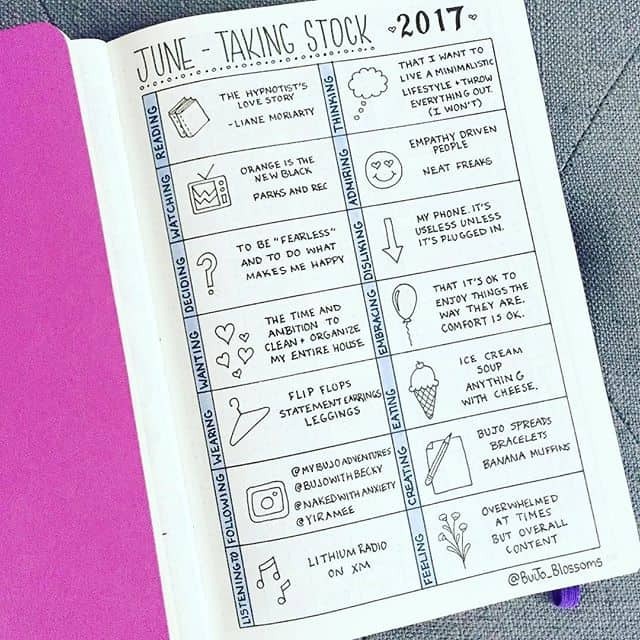 It’s such a neat way of setting out your monthly goals, and of course you can label the columns any way you wish! 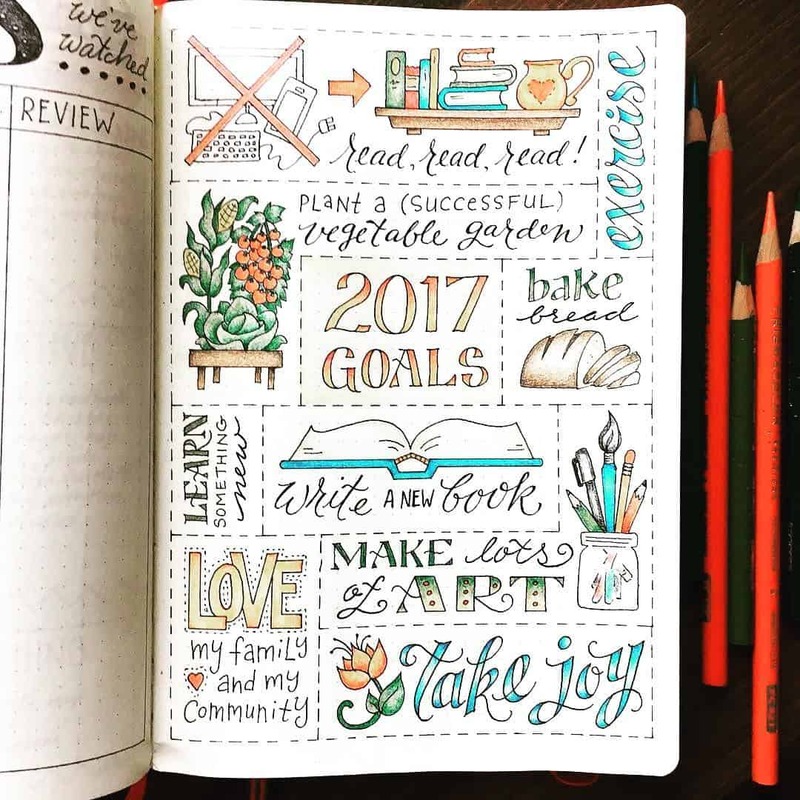 We already talked about using a spread to see your year at a glance, and this is an example of how you can do the same thing by month. Once you have your monthly goals and plans sorted you can decide whether to track those actions on a daily or weekly plan. Here’s a fabulously retro example of how you can lay out your weekly spread. If you need some more inspiration we have a whole collection of weekly spread ideas for you! 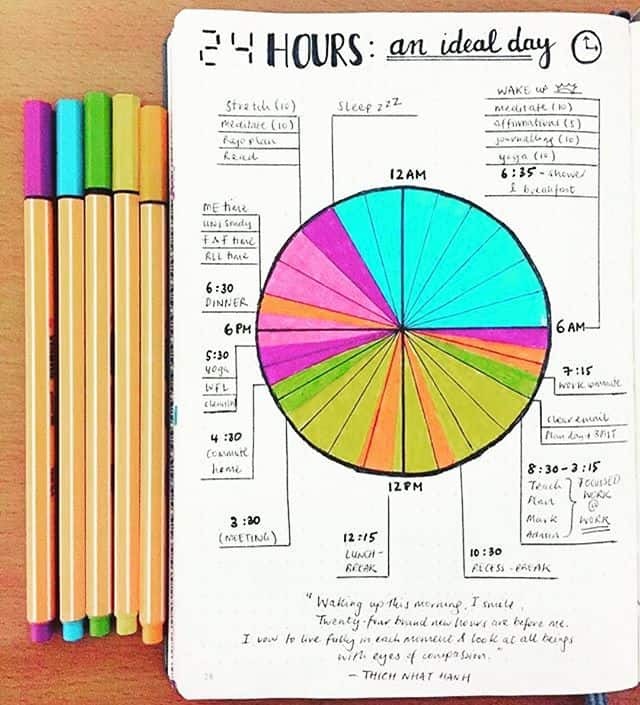 This daily plan bar uses a time ladder approach to list out the hours of the day down the left hand side of the page and you can schedule in appointments or activities. Then the rest of the page can be used for notes and ideas. I really like this Core Four habit tracker hack, it’s perfect if you like to use a daily spread because you can just add it in each day. And while Jess uses it to track habits you don’t have to, you could use it to make sure you complete your Most Important Tasks each day. Or even a combination of the two. That’s the beauty of the Bullet Journal right? Check out what other people are doing and then add a little twist to make it work for you! Don’t forget that goal setting forms part of a cycle, and that you need to add in review points in order to make progress. So schedule them in at regular intervals using ideas and hacks like these. Whether you use a daily spread or a weekly one taking time out each evening to plan for tomorrow will get your day off to the best start and help you be productive. Check out this video to see what your evening routine could look like. 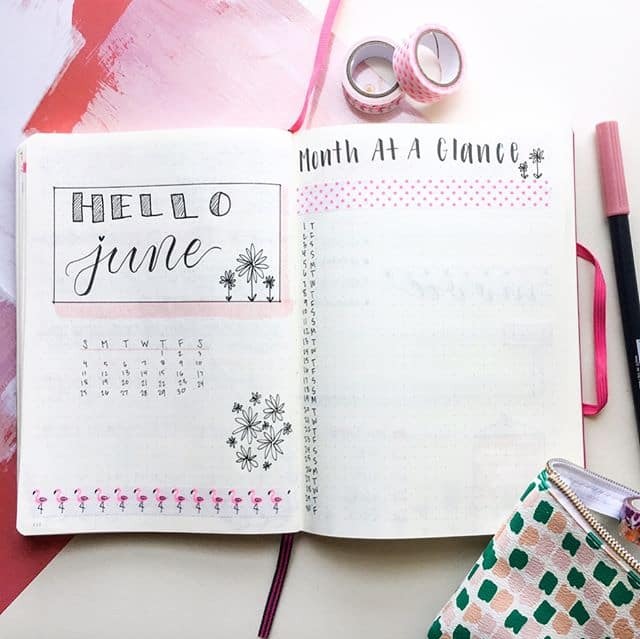 Reviewing the day and planning for the day ahead is an important part of your planning system and if don’t purposefully set aside time to do it you’ll fall off the Bullet Journal bandwagon! 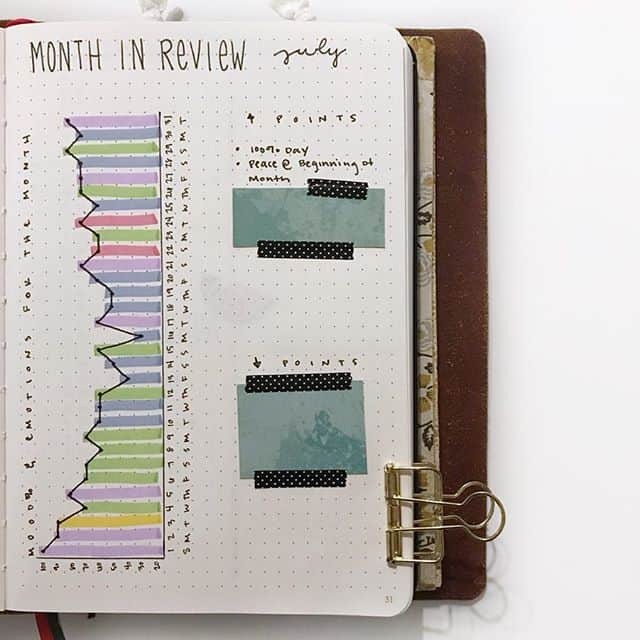 Whatever goals you are tracking in your Bullet Journal during the month be sure to sit down at the end of the month and review your progress. You might write some comments or create a colourful little graph like this one, but you need to review how last month went before you can really set your goals for the next month. Or try doing your monthly review in a “taking stock” layout like this one. 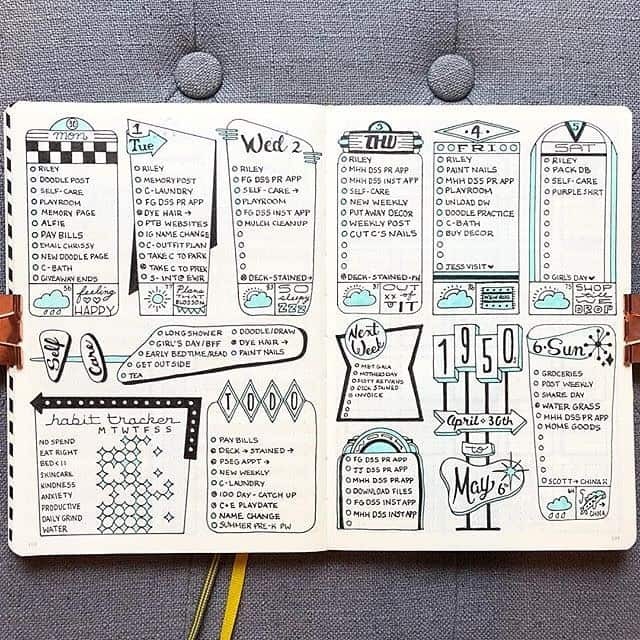 This layout is based around “memories” from the month but you could easily do something similar to highlight your achievements towards your goals. Don’t you find that setting your goals is the easiest part of the task? After all it’s about the fun planning side. But what about actually ACHIEVING those goals? Yeah when it’s time to get down and do the work the procrastination often sets in! 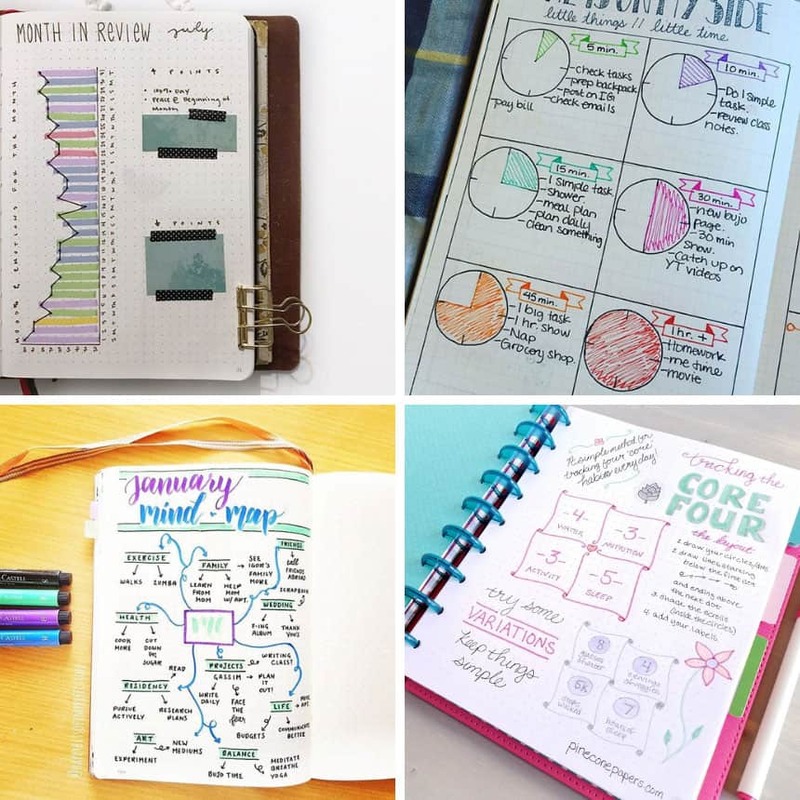 Which is why you need some productivity tools, and what better place to put them that in your Bullet Journal? This little productivity hack is a great way to put those random spare minutes to good use! 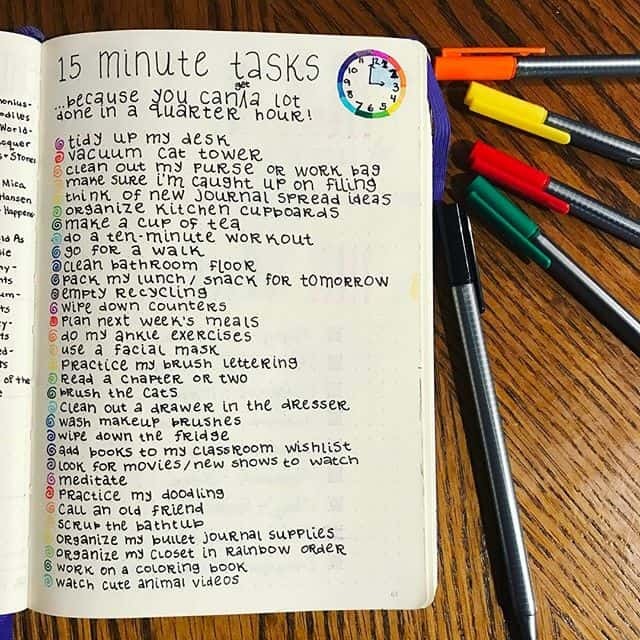 Write out a list of all the productive things you can do in 15 minutes or less, and next time you find yourself reaching for your phone to FB look at the list and do something useful instead! It might also help to apply a little Getting Things Done context key too, because you can’t scrub the bathtub while waiting in the car pool line, but you could read a chapter of a book or even practice your doodling! Here’s another take on the “making the most of the little bits of time” strategy. This one is broken down into different time blocks though including some longer periods of time. Another good way to increase your productivity is to think about what an idea day looks like. If you could make all 24 hours of the day work for you what would the day look like? Once you’ve mapped it out you can then see what a “real life” day looks like in comparison and try to figure out what’s getting in your way. 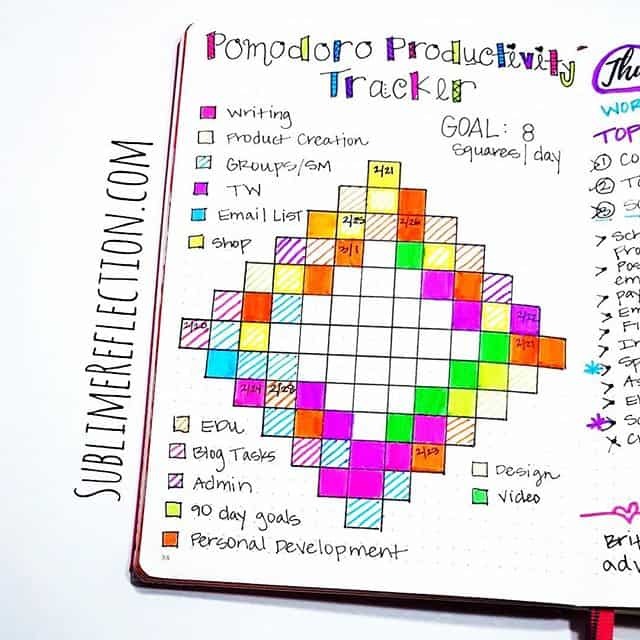 If you love using the pomodoro technique to manage your time then you’ll love this spread. If you’re now thinking about making pasta sauce for dinner then you might want to go learn more about the pomodoro technique! 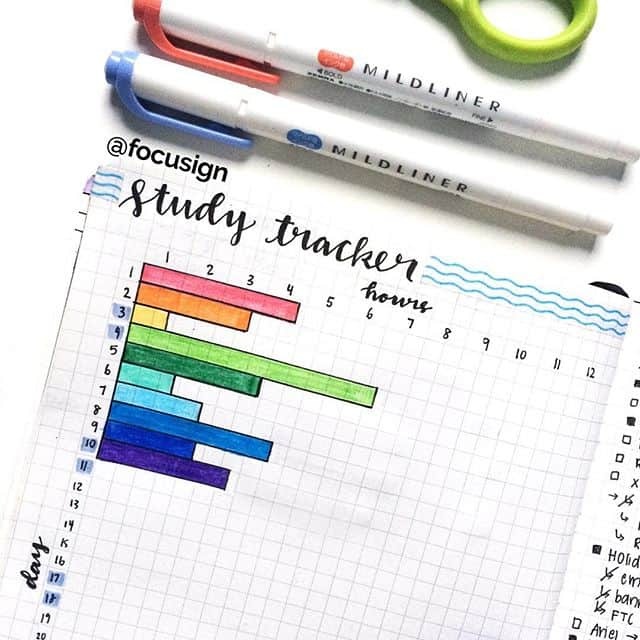 Whether you’re tracking study hours, or work hours, or hours spent cleaning your house, seeing it in black and white (or bright colors) helps you track your productivity! If you’re being productive for the whole amount of time that you set aside to be but you need more hours in the day to complete your goal activities it’s time to look at the rest of your day. 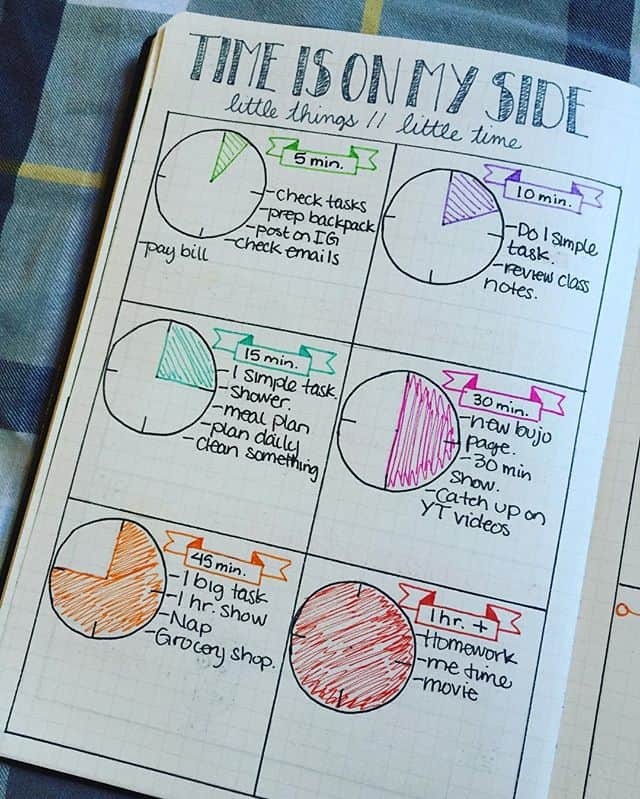 A time log spread like this can help you see just what you’re spending your time on, and then you can decide whether you want to cut back on your Netflix time or sleep to do something more productive instead.